In 2008 we drilled a well in Mwitanzige located in an arid area of Uganda. The villagers were walking 4 Kms (about 2.5 miles) to get water, and the children were missing school because of the time it took them to walk and then wait in a long line for their turn to fill their water containers. 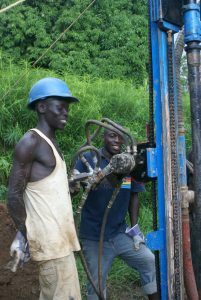 Through God’s good grace, CEED’s drillers hit an aquifer, an underground stream that never dries up. The local well committee charges a small fee, one or two cents a gallon, for each jerry can to be filled with clean water from the pump located in the middle of the village. People come to pump fresh water from before sunup to after sundown every day of the year. From the fees collected, the villagers have kept the pump in good working order, built a new, larger church, built shops, increased farm yields, and generally have raised the standard of living materially and spiritually. It’s a very significant demonstration of the real value of clean water in a poverty-stricken area when the water project is appropriately managed by the community. CEED’s Water Solutions for Africa is centered in the town of Hoima, which is in the Bunyoro-Kitara region in the Great Rift Valley geological system. CEED has been working in this region since 1999 and has made an in-depth study of the many factors that have resulted in a water and health crisis for this rural population. The water crisis and the accompanying health crisis in Uganda are caused as much by cultural as physical reasons. 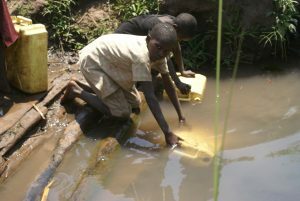 In the past ten years the Ugandan Government and many well-known charities have drilled hundreds of wells throughout the rural regions, and yet the people are still without clean water. Water Solutions for Africa is taking a new approach to this problem with innovative engineering solutions and pilot projects which encourage communities to be proactive in solving their own water problems. 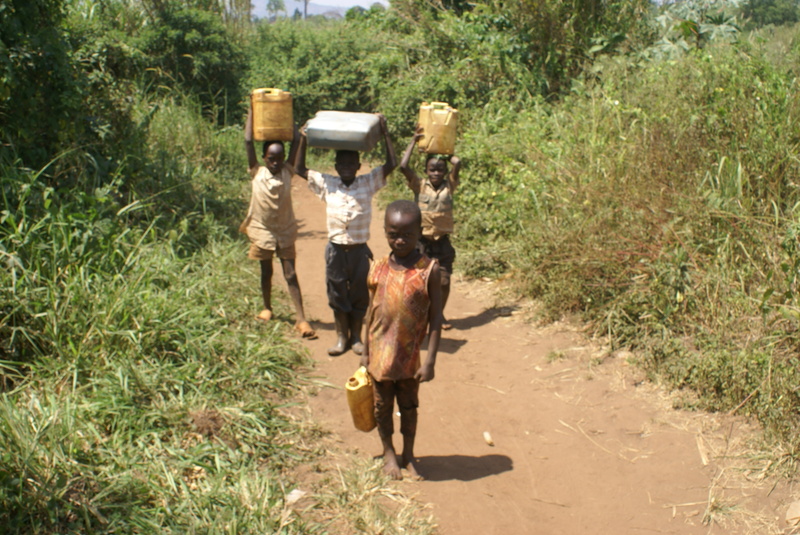 In rural Uganda, village populations have outgro wn their initial water sources and fetching and purifying water has become a burdensome task that takes up many precious hours every day. Women and children walk miles to find water for their families. Often they draw polluted water from a stream or pond that they share with cattle and wild animals. After a long day at school, children as young as 4 or 5 drag jerry cans of water (weighing approx 45 pounds) and risk their lives as they scurry along the dirt roads amidst speeding trucks and hurried taxi drivers. Although people know they should boil the water for at least fifteen minutes, as night draws near they become impatient. Often they have had nothing to drink all day and they no longer have the energy to gather firewood to boil the water, or the patience to wait for it to cool, so they drink the polluted water or continue to stay dehydrated. Whichever they choose, the cycle of sickness continues. Our first task was to find a way to drill new wells (“boreholes”) for less than the typical $10,000 most non-governmental agencies charge. By using local labor provided by those who would benefit the most, and going back to simpler technologies, we have been able to reduce the average cost to less than $4000 per borehole. Our next challenge was to employ a Ugandan manager to oversee all the new drilling, repair work and village committee communications. 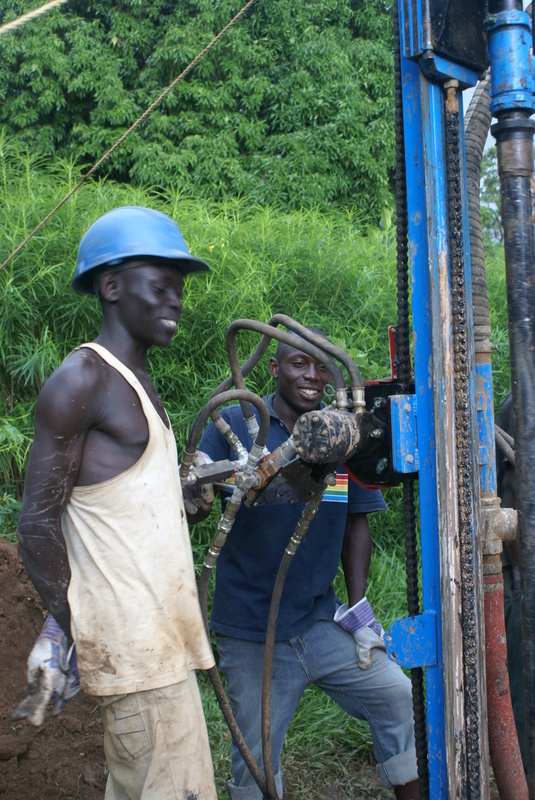 Our manager has trained a crew of Ugandan “water engineers” who refurbish inoperative wells and operate the hydraulic rig to develop new ones. To date (January 2019) we have drilled or rehabbed more than 350 boreholes, used by more than 400,000 people. And the team is still working.